Professor Kiessling earned a S.B. in Chemistry from the Massachusetts Institute of Technology and a PhD in Organic Chemistry from Yale University. After two years at the California Institute of Technology as an American Cancer Society Postdoctoral Fellow, she joined the faculty of the University of Wisconsin, Madison in 1991. In 2017, she returned to MIT as the Novartis Professor of Chemistry. Her interdisciplinary research interests focus on elucidating and exploiting the mechanisms of cell surface recognition processes, especially those involving protein-glycan interactions. Another major research interest is multivalency and its role in recognition, signal transduction, and direction of cell fate. Laura is a Fellow of the American Association for the Advancement of Science, and a Member of the American Academy of Microbiology, the Wisconsin Academy of the Arts and Sciences, the American Philosophical Society, and National Academy of Sciences. She has served as Editor-In-Chief of ACS Chemical Biology since 2005. 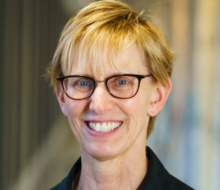 She is a member of the Research Advisory Board of GlaxoSmithKline, the Yale University Council, and the Council of the National Academy of Sciences. Her honors and awards include a MacArthur Foundation Fellowship, a Guggenheim Fellowship, the ACS Gibbs Medal, and the Tetrahedron Prize.